We have requiring beautiful family homes show quality pug puppies self helped from top show lines with champions in the pedigree. Mum can be seen with puppies as she is our pet as well as grandma and dad can be viewed on request all pde clear and have no breathing issues. These outstanding puppies are being raised in our family home and socialised with other dogs and children. They are very chunky puppies and are getting only the best from us. They are wormed and fully veterinarian health checked. They will come with first vaccination. micro chipped. insured. scent blanket. supply of food. toys. and puppy pack and a lifetime of help and advice for your puppy. Only serious enquiries please no time wasters these puppies have had a fantastic start in life and we will ensure that this continues with their new families. Boys and girls available. 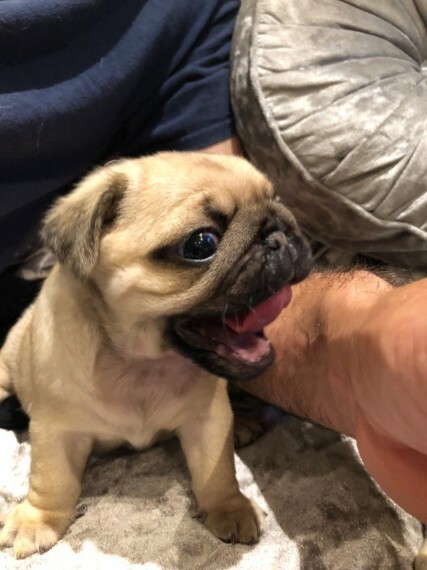 .200 deposit secured your puppy. Will be ready from 4th october ..... update just 1 pale fawn girl and 1 fawn boy available Must be seen to appreciate the quality of these stunning puppies.